With an additional cable modem, you can also use the FRITZ!Box on a cable connection. Since the FRITZ!Box establishes and controls its own internet connection over the cable modem, all FRITZ!Box functions (such as internet telephony, firewall) are also available without restriction in this operating mode. Either connect the cable modem to the first multimedia socket or to the socket that the cable technician used for the original installation. Only use the coaxial cable (without an extension) provided by the cable technician to connect it. If the FRITZ!Box is connected to the cable modem, clear the connection between the cable modem and the FRITZ!Box, then restart the cable modem. Note:You can restart the cable modem by briefly unplugging it. It may take several minutes for the cable modem to restart. 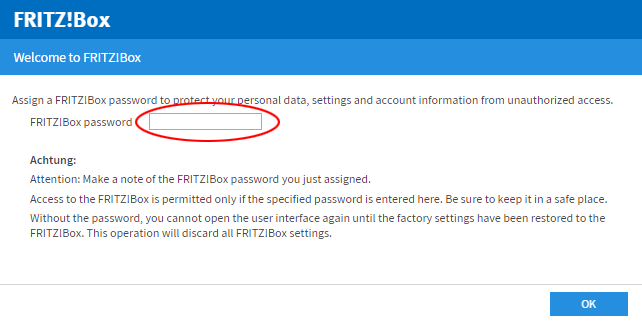 If the FRITZ!Box is set to factory settings, set a password for accessing the user interface, and click "Register" and then"Next". If your internet service provider is not displayed, select "Other internet service provider". Click "Next" and follow the wizard's instructions. 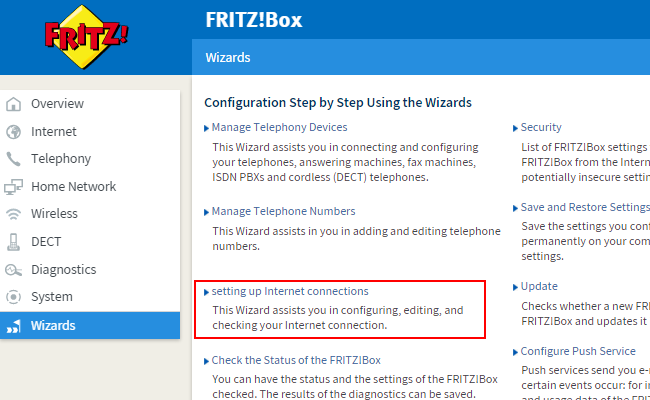 The wizard takes you through the configuration of the internet connection and indicates when to use a network cable to connect the cable modem to the "LAN 1" port on the FRITZ!Box. Now the FRITZ!Box establishes its internet connection over the cable modem. Configure the FRITZ!Box for telephony over a cable modem.